September has been busy with all sorts of writing-related events. Lucky for me, that's a nice way to be busy. I already mentioned Kim Baker's launch party for her debut novel. I read her book last weekend, and I really enjoyed it--not just because Kim is a nice writer in my region, but because PICKLE is a super fun story that's very well-written. I was impressed with her opening, her cast of characters, the heart, the humor, the tightness, the freshness, the ending...the whole enchilada. I think her characters were my favorite part, but it's hard to say because the shenanigans they got into were clever and entertaining. PICKLE is a great example of excellent middle grade. Liberty Bay Books hosted a launch party for my friend Suzanne Selfors on September 9. 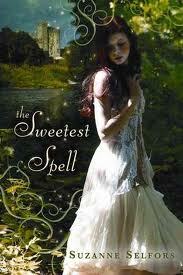 I have not yet read THE SWEETEST SPELL, Suzanne's first fairy tale, but I definitely will. I sent my autographed copy to one of my cutie-pie nieces who is an avid reader, so now I need to get my hands on another one! You know those authors whose books sing for you and help you slip into your own work? Suzanne's books are like that for me. Meg Cabot's, too, though I've never met Meg Cabot. I hope to someday, though! Lots of friends were at the launch party for Suzanne's latest novel. Left to right, here are authors Susan Wiggs, Carol Cassella, Suzanne Selfors, Sheila Roberts, and Elsa Watson. I'd like to note that Sheila mentored me for six years, and I will forever appreciate all she taught me about writing. And life. SCBWI Western Washington kicked off the 2012 season on September 13. Agents Bree Ogden and Mandy Hubbard spoke at our meeting, and each one led a workshop. I attended Ms. Hubbard's, which was on revision. Ms. Hubbard is also an author, and it was really cool to hear how she approaches the same hurdles I encounter when revising. I picked up some helpful gems I can apply to my own work. Author and illustrator Richard Jesse Watson spoke at a Field's End Roundtable on September 18. His talk, "The Up-Close, Far-Out World of Kids' Books," was excellent, and it gave me a mid-week creative boost! If you ever have the opportunity to hear Richard Jesse Watson speak, don't miss it! In other news, my husband returned yesterday from a business trip to Australia. The good news is he's back and he returned with gifts! The bad news: he forgot (supposedly) my request to film a flushing toilet, providing evidence that the Coriolis effect is not a myth. That would be fun and classy blog footage, yes? This wasn't the most productive writing week I've ever had. I timidly poked at a new-ish idea instead of pushing forward in my WIP because my manuscript has me feeling a bit like this. Here's the deal: I complete things. Take reading, as an example. I still sometimes have to remind myself it's okay to set aside books that don't grab me. Life is short, and there are countless great books out there. Why waste time reading the ones I don't really want to finish? Along the same lines, I complete the manuscripts I believe in and love. You know how it is, that need to get a story out of your dreams and on to paper (or screen). Then comes the revising, when that fire inside keeps you working on a manuscript until it's just right. It's a passion that grips a writer by the heart and the brain. Lately, however, this one particular manuscript has me less than fired up--even though I still love it. Maybe it's now a we-should-just-be-friends love rather than an I-want-to-devote-all-my-writing-time-to-you love. Or maybe this manuscript and I are meant to be, and I just need some space, and to consider all my options. What I do know is this (and it may seem like a topic leap, but hang in there with me): There is one advantage to not being under contract. Seriously. There are oodles of disadvantages, and it will be huge when I get my first contract. H-U-U-U-G-E. In my mind, the Earth itself will spin smoother, the flowers will bloom bloomier, and everything will be like this. What is the one advantage? I can write what I want. I'm allowed to play and truly experiment without limits. I've had two authors encourage me to embrace this time because of that reason. An optimist, I'm trying to do just that while keeping a structured writing life with self-imposed deadlines, rewards, and all the rest. Taking joy has always led me to the work that makes me the proudest. So! This week while I write, I'll pull out whichever project speaks to my heart. Hellooo, bloggy friends! How the heck are ya? I hope everyone had a nice summer. I did! And now it's already September! While I get a bit blue about my kids going back to school each year, a piece of me craves the more structured days and the rhythm of fall. Funny thing is, it now truly feels like summer in Seattle. The sunshine took its time getting here, but it was worth the wait! But enough about that. Let's jump right into things! 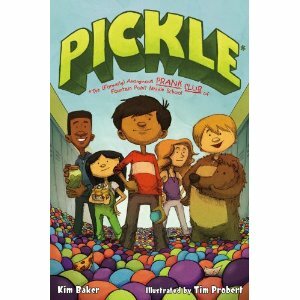 September 4 was the release day of Kim Baker's middle grade novel, PICKLE: THE (FORMERLY) ANONYMOUS PRANK CLUB OF FOUNTAIN POINT MIDDLE SCHOOL. She had an uber-fun launch party Tuesday night at Secret Garden Books, and the place was packed with SCBWI-ers. Something extra special for me was I went with my husband, Jim, and he was able to meet oodles of SCBWI friends. I must have smiled for hours afterward, electrified by the energy of all those cool-as-a-cucumber (Get it? Cucumber? Pickle? Oh, it loses something when you point it out. Note to self: Don't do this in manuscripts!) writing and illustrating people, most of whom I hadn't seen all summer. Kim's a friend and one of our Co-Regional Advisors, so we're all spoiled by her wit and talents on a regular basis. It was a great night, celebrating Kim and her debut novel! This is Kim with author Martha Brockenbrough. Here Martha and I display our brand-spankin'-new books! I look forward to reading Kim's novel! *PICKLE is a Junior Library Guild Selection. *"Sure to please anyone with a puckish sense of humor..."
In the comments, I'd love to hear any updates or news you might have. Or tell me something about your summer! Also, what are you reading?